New maps show how the Missouri River crossing for the Dakota Access Pipeline (DAPL) puts the greatest risks on those communities where Native Americans live. Jennifer Veilleux and fellow geographer Candice Landry developed maps looking at issues of environmental justice around DAPL. 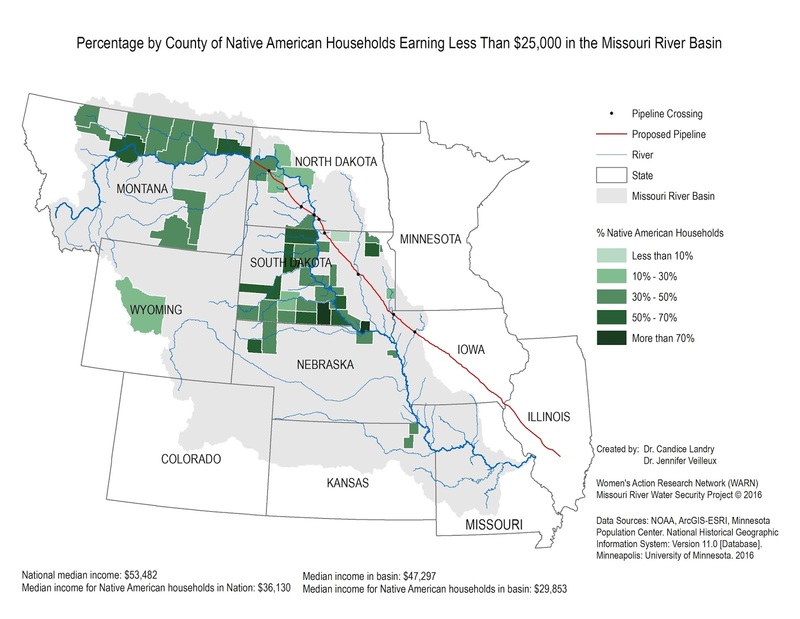 The article is titled: Income Maps of the Native Americans Living in the Missouri River Basin, and here is one of the maps. Notice that once the pipeline crosses the Missouri just above the northern tip of the Standing Rock Reservation, the river flows through a series of counties which have a disproportionate number of Native American residents. The Des Moines Water Works CEO is quoted saying while leaks are inevitable, they have plans to deal with them. Iowa residents held their own protests trying to stop the pipeline, but were unsuccessful. Carolyn Raffensperger, executive director for the Iowa-based environmental group Science and Environmental Health Network, noted the frustration she felt while watching the drilling and pipe installation. She has filed legal challenges and criticized the regulatory process for pipeline permitting, saying the layers of bureaucracy makes it difficult for citizens to be heard in any significant way. Mark Trahant, the Charles R. Johnson Endowed Professor of Journalism at the University of North Dakota and a member of The Shoshone-Bannock Tribes, also is an independent journalist and publishes the Trahant Reports. He comments to two recent leadership changes in recent posts. First, Trahant gave a good critique of incoming North Dakota Gov. Doug Burgum in an article headlined: North Dakota’s new governor misses Standing Rock moment. Those daily demands are because the state of North Dakota made it so. Pick a word: defuse, de-escalate, negotiate. There were so many better alternatives, ones that were dismissed in favor of sending in the cavalry. I have interviewed many government officials over the years that successfully reduced tension instead of using the police powers of a state. In every test the state failed in this regard and the new governor is following the same path. This is a much better appointment for Indian Country. Zinke is no less conservative than Rodgers, but since his days in the Montana legislature he has had an open door. He has reached out to tribes in a number of ways. He introduced and championed the Blackfeet water compact and he has supported federal recognition for the Little Shell Band of Chippewa Cree. Follow the Trahant Reports here.